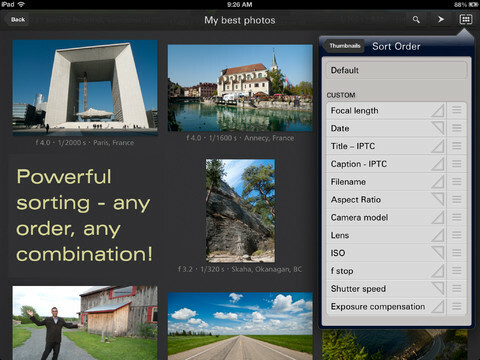 Sarofax announces that their top-selling iPad Photo app – Focus Point – has been updated to included sophisticated album sorting and thumbnail labeling. Focus Point 1.3, which is available on iTunes for $3.99 USD has been updated with sophisticated sorting and labeling. With the new features, Focus Point ups the game in the premium photo browser category. There’s simply no other app that has implemented core browsing features as advanced as Focus Point. Aimed at amateur and intermediate photographers, Focus Point is the only photo app with dynamically resizable thumbnails, a feature normally seen only on desktop apps. Other photo apps have fixed size thumbnails. With Focus Point, you can just pinch or zoom your fingers, and thumbnails shrink and grow instantly. The new thumbnail labeling feature allows you to add context to thumbnails – by default showing title, date, or filename. But if you want to review your photos – choose to show exposure bias, ISO, shutter speed, and focal length. You could even choose to show camera model and lens. It’s completely customizable, and makes for a great way to review images. Focus Point continues to offer a detailed metadata view. “There’s so many apps that just list metadata detail properties in a list without any formatting or presentation. How useful is that?” asks Ash. In the full-screen mode, a swipeable panel displays titles and captions, a geographic map in the first panel, the camera settings and EXIF in the second panel, and file information such as the name, size and aspect ratio in the last panel. Focus Point provides a beautiful minimalist design throughout, with useful features through the use of gestures – from manual slideshow controls that allow swiping back and forth, to the ability to edit captions and titles with dictation. Search capabilities include searching albums by title, caption, date, keywords, or filename. Focus Point is compatible with iPad devices running iOS 5.1 or later. This entry was posted on Monday, March 18th, 2013 at 4:50 pm and is filed under Digital Products, National News, New Releases. You can follow any responses to this entry through the RSS 2.0 feed. You can leave a response, or trackback from your own site.